When it comes to your pet, the best veterinary care is a top priority. There are a variety of services pets need to stay healthy and looking their best. Often times, pet owners have to take their pet to multiple locations to get all the services they need, however, hoping to have one place that can take care of everything. The Southern Hills Veterinary Hospital is just that, offering numerous services to ensure that you pet is well taken care of. One of the many services we are known for is our health care. Our office offers daily emergency services until 10 PM and referrals past that time, if necessary. In addition to emergency services, we provide routine medical care where we monitor your pet’s health and nutrition. At your pet’s appointment, we will conduct a full-body exam where we check the temperature, skin and coat, hearing and vision, internal health, and oral hygiene. We also recommend staying up-to-date on all vaccines to prevent common diseases and infections. 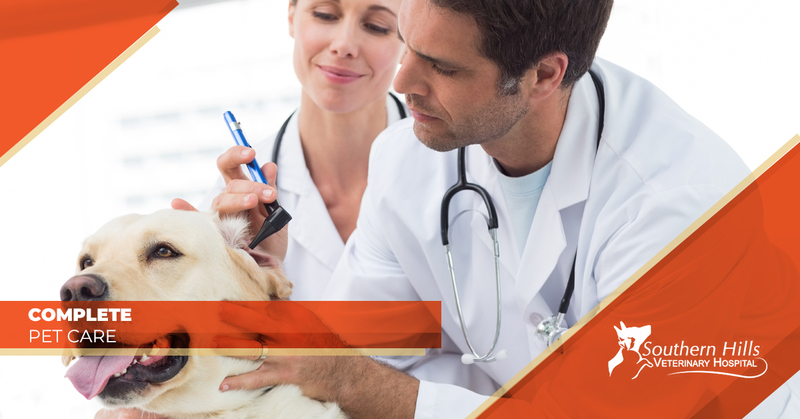 Our team of veterinarians will diagnose any health issue that may be found and offer options so that you can choose what is best for your pet. Upon diagnosis, we are also able to perform surgery to treat any injuries or disorders, using our top-of-the-line facility and equipment. After any procedure is performed, our staff will take great care making sure you have all of the information you need for recovery and that your pet is healing as it should. A big concern of pet owners is figuring out who will take care of your pet while you are out of town. We, too, want your pet to have the best care while you are away which is why we offer overnight care. As a guest at Southern Hills Veterinary Hospital, your pet will enjoy their stay in our safe and clean facility, equipped with 24/7 staff supervision and air-conditioned kennels. We have an outdoor play area where pets can interact with each other while getting exercise and fresh air. We also provide food, water, and bedding for their stay and they have access to around-the-clock veterinary care, if needed. To make the stay more enjoyable, we suggest bringing items from home to ease the stress the stay can have on your pet. In order to stay for overnight care, pets must be up-to-date on all medical care and vaccinations, and records must be presented at check-in. We look forward to your trust in us to provide all-encompassing care for your pet. If you have any questions regarding any of the services we offer, please feel free to contact us. If you are searching for the highest quality of veterinary care, there is no better choice than Southern Hills Veterinary Hospital. When it comes to taking care of the medical needs of your pet, we are committed to excellence.